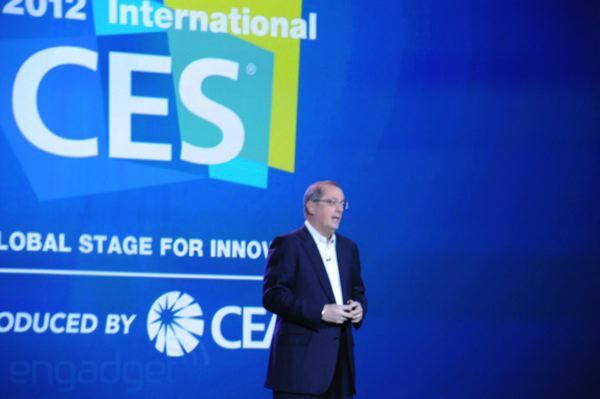 Intel has already held one epic event filled with sweet, gadget fun at this year's Consumer Electronics Show -- but the party isn't over yet. 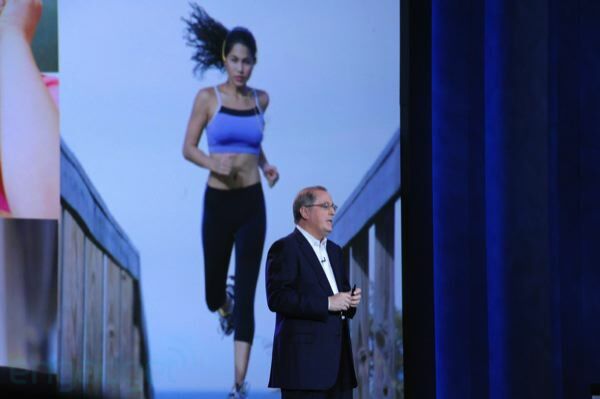 Now it's time for the company's top dog, Paul Otellini, to take the stage and deliver his 2012 keynote. Presumably we'll be getting a healthy dose of Medfield and a heaping-helping of Ivy Bridge. 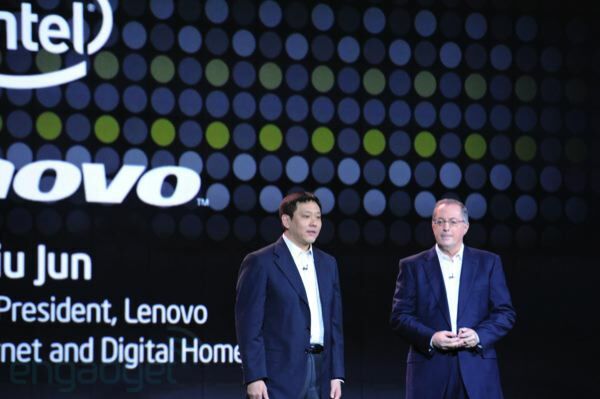 So what does the future of laptops, desktops and tablets hold? 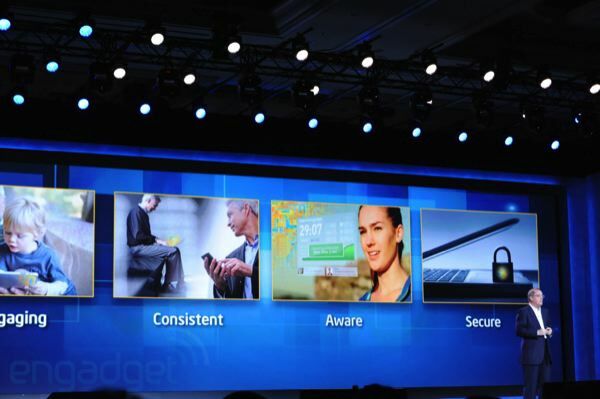 And what does Intel envision for our computing future? Follow along with us to find out. 8:39PM Apparently Paul didn't think he could follow Mr. I.Am's ghetto blaster. 8:38PM And it looks like we're through. 8:38PM He's gone and now Otellini is talking about continuing to raise the bar. 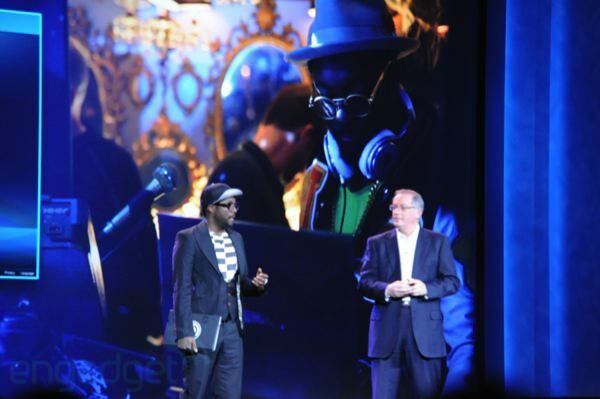 8:37PM Will.I.Am just blew our minds with his ghetto blaster -- the Intel ultrabook. 8:37PM Thanks causing the people around us to flee in horror. 8:36PM But he's giving us a special sneak peak. 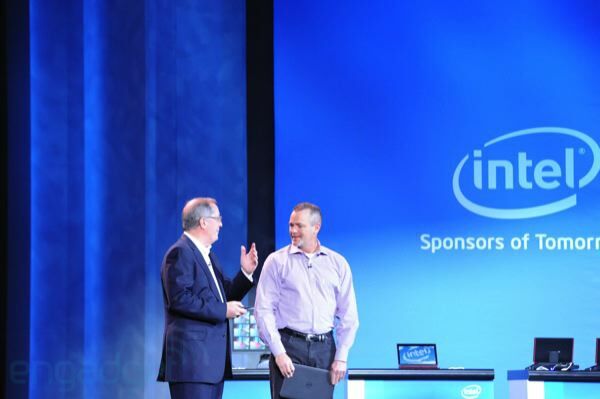 THANKS INTEL! 8:36PM You can check out the first song in the project now at Intel.com, but it'll be limited to 10,000 downloads. 8:35PM Otellini is getting a little fidgety to. 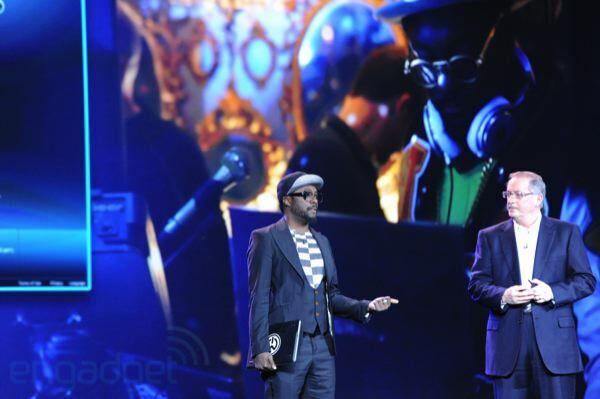 Some one should tell him that will.i.am is no threat -- Now Fergie, she's crazy. 8:34PM Presumably that's cause he just loves it so damn much. 8:33PM He's struggling to come up with the words to describe his experience with an ultrabook. 8:32PM He's doing some project where he'll be travelling to 12 cities in 12 countries and writing one song for each (that's 12 in total -- don't want you to have to take off your shoes). 8:31PM And now he's on stage. 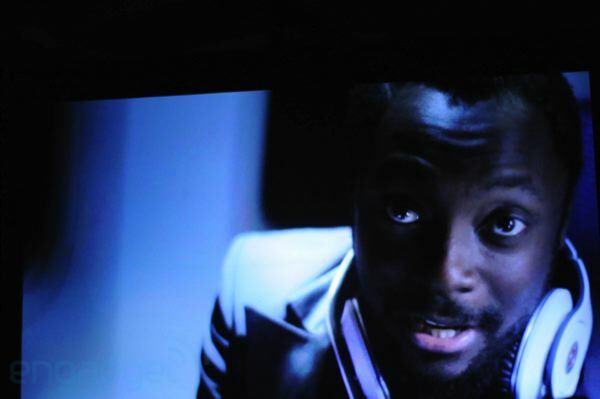 8:31PM Will.i.am is talking up ultrabooks in a video now. Backed M83's Midnight City -- you know, good music. 8:30PM You'd think ultrabooks were an ugly daughter Otellini was trying to get you to date they way he keeps talking them up. 8:29PM And Otellini is back. 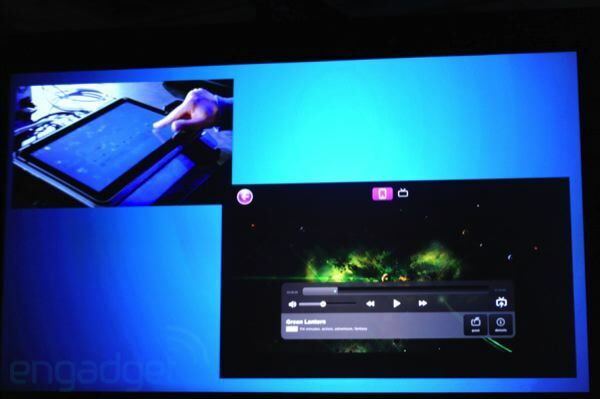 8:28PM Now we're looking at Windows 8 on a convertible Ultrabook in tablet mode. 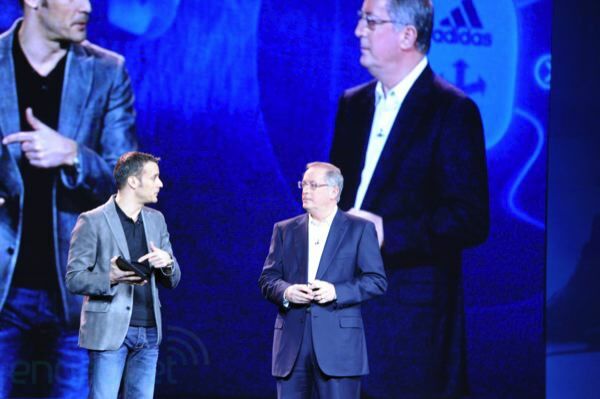 8:28PM At this point they could probably just drop the mic and walk off the stage. 8:27PM Demoing the same trick with his phone -- like Google Wallet for your home shopping. 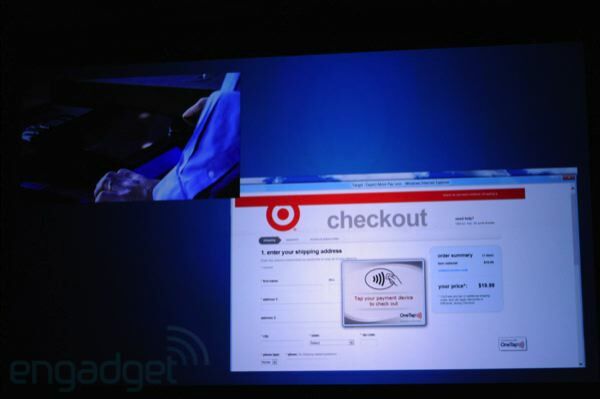 8:27PM Dude just used NFC to tap his MasterCard on an Ultrabook to automatically enter his payment on Target. 8:25PM MGO has a very touch friendly UI. And we're being "treated" to a clip of Green Lantern. 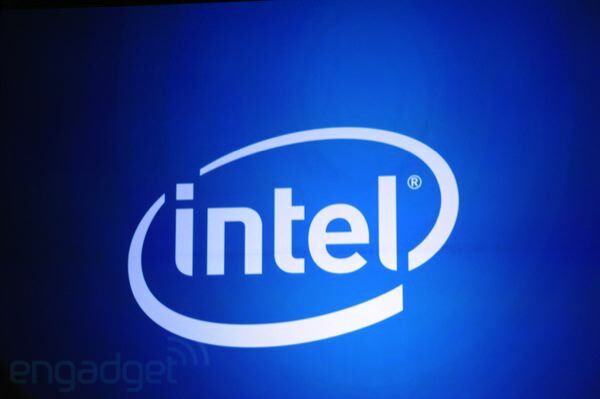 8:24PM The service will be available through Intel's AppUp center. 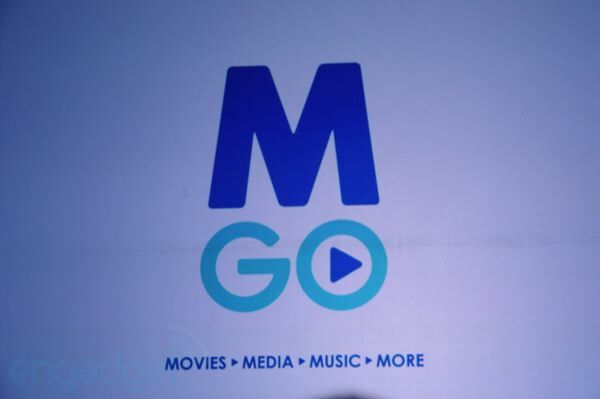 8:24PM MGO, a media service from Intel and some content partners coming later this year. 8:23PM Ok, so a 1.45GB copy of Cars was copied from an external drive to the ultrabook via Thunderbolt in about 30 seconds. 8:22PM Now we're demoing file transfers... This better impress. 8:22PM Using the touch screen to pan around a 360-degree panoramic video. 8:21PM Now there are some creepy people dressed up as various characters played by Johnny Depp staring at a camera. 8:20PM Touchscreen ultra book playing Fruit Ninja is next. We really need to get some new games to demo when showing off touch-capable machines. 8:20PM Does seem to stutter a little bit with the integrated graphics, but not too terrible. 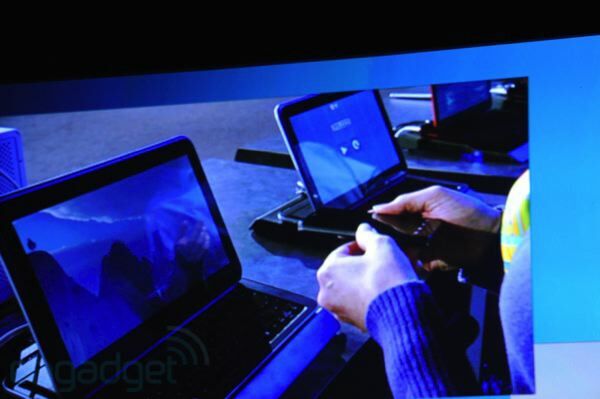 8:19PM We're getting a Call of Duty demo on an ultrabook. 8:18PM And Otellini has stepped off for a breather we guess. 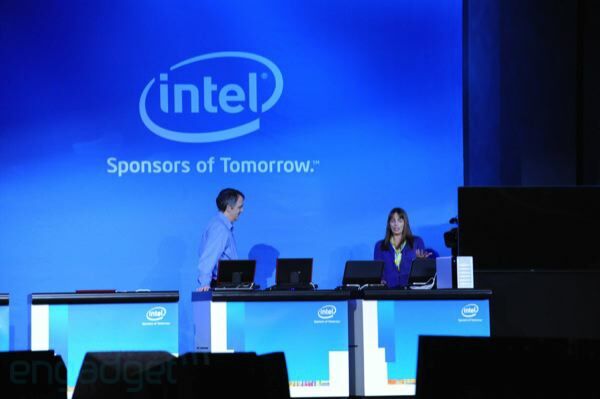 8:18PM Pile of Ivy Bridge machines out on stage now. 8:18PM It's got a sliding and pivoting screen. 8:17PM Now we've got some laptop, tablet hybrid on stage. 8:17PM Machines should conform to your needs, not the other way around -- we couldn't agree more. 8:17PM Now it's time to wax poetic and ask rhetorical questions apparently. 8:16PM And once again, Otellini stands alone. 8:16PM It'll be up for order in February. 8:16PM Bitlocker encryption and plenty of other enterprise-friendly features. 8:15PM Core i5 or i7 options. 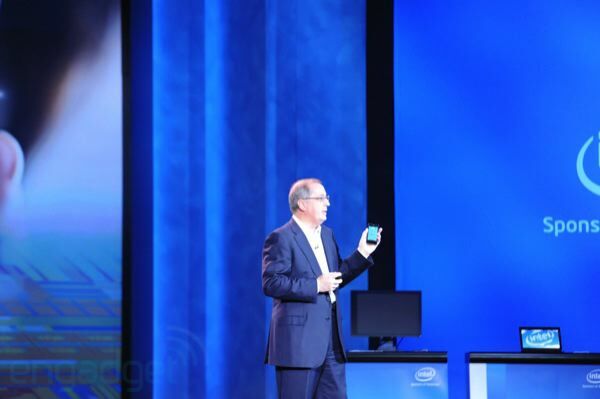 8:15PM Clarke claims almost 9 hours of battery life -- we'll believe it when we see it. 8:14PM It's really quite nice looking. But lets hope they're lying about it not being just a pretty face. 8:14PM Gorilla Glass display for those of you that have trouble not shattering your laptops. 8:13PM It's nice to see a Dell laptop packing an aluminum lid and a carbon fiber base instead of plastic. 8:13PM Clarke keeps bringing up how long Dell and Intel have worked together, you might think Otellini was threatening to break up with him. 8:12PM XPS 13 is officially official. 8:11PM Here come Jeff Clarke from Dell. 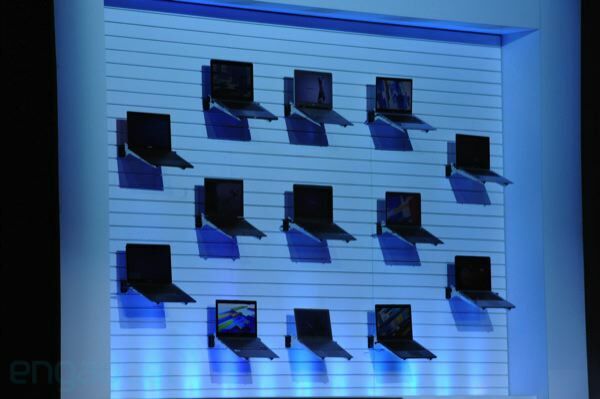 8:10PM We've got a wall of ultrabooks now, including models from Acer, ASUS, LG, and Samsung. 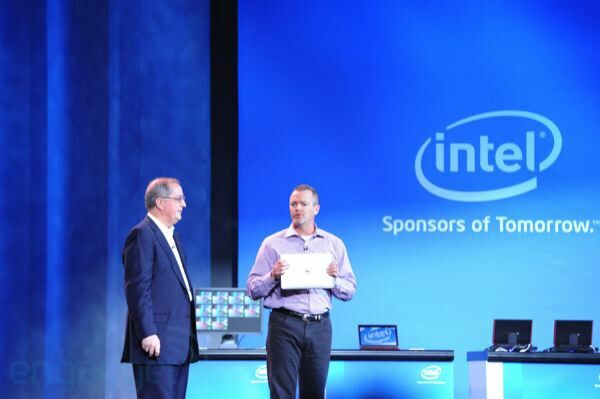 8:09PM Time for a video about ultrabooks and for us to take a nap with our eyes open. 8:08PM Now it's PC time. 8:08PM Otellini is such a tease. 8:07PM And just like that, it's gone. 8:07PM Atom to be specific. Incase you could guess. 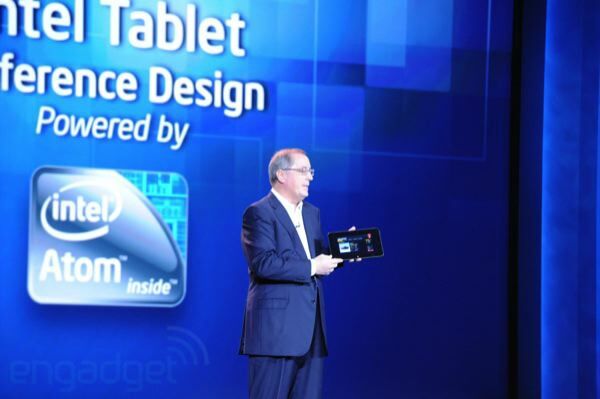 8:07PM 22nm Intel tablet processor inside. 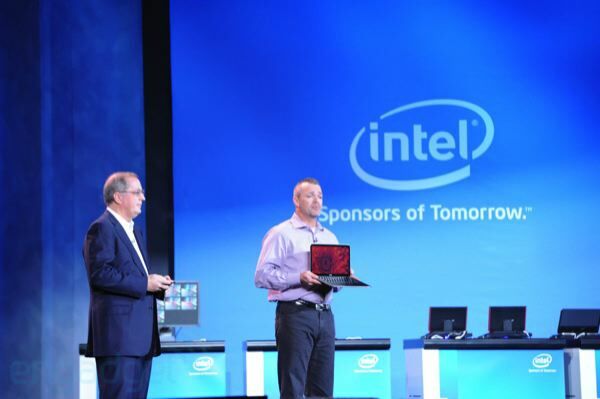 8:06PM Now we're looking at the Intel reference design for a Win8 tablet. 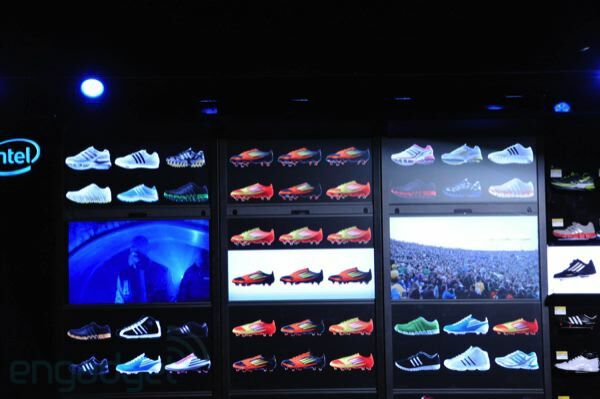 8:06PM Adidas is going run a couple of more consumer tests, but plans to have a major roll out in time for the London Olympics. 8:05PM The shopping wall is connected to a tablet where the purchase can be completed. 8:05PM It's actually a pretty neat visual -- some guy is swiping through footwear on a wall, check what people are saying about them on social networks and (for some reason we're not too sure about) playing back video. 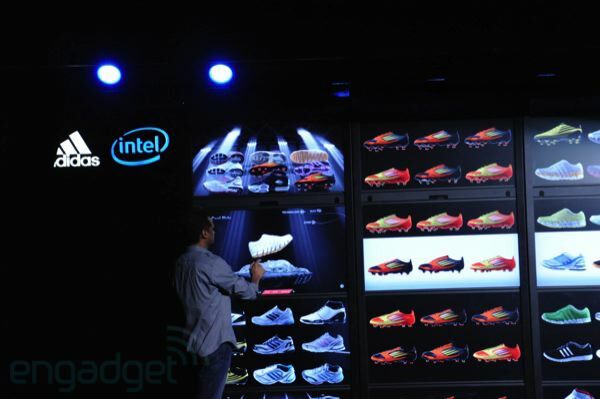 8:03PM Extending physical product range with a virtual product linueup -- basically it's one panel of actual shoes placed next to a bunch of screens cycling through other sneakers. 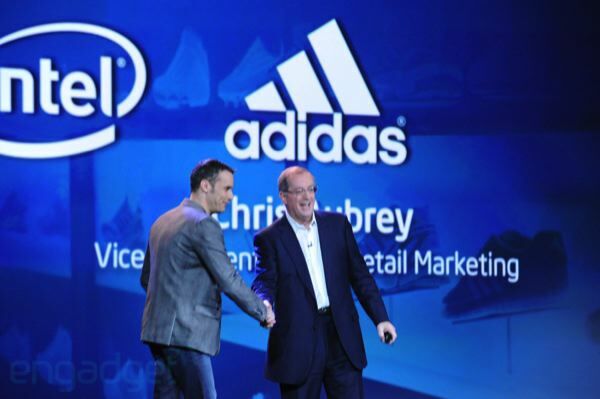 8:02PM Chris Aubrey from Adidas is out now to talk shopping experience... in the FUTURE! 8:02PM Now we're talking about combining the convenience online shopping with the satisfaction of in-store purchases. 8:01PM Now we're talking about how pervasive computers have become. Apparently they're everywhere. 8:01PM Sadly that's all he could say for now and took off. 8:00PM Devices should enter carrier validation this summer, with a commercial launch shortly after. 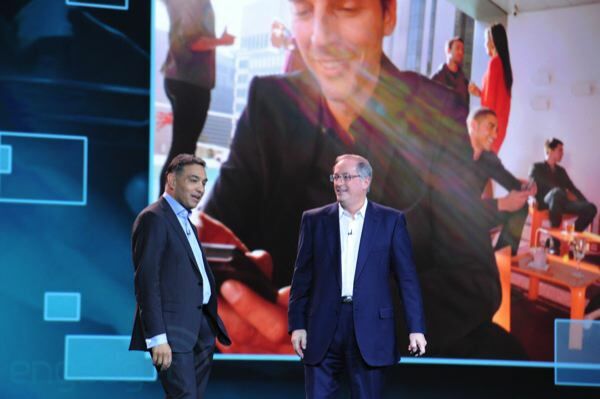 8:00PM The two have entered a multiyear deal to produce mobile hardware together. 7:59PM He's thrilled about the opportunity to build devices based on Atom hardware. 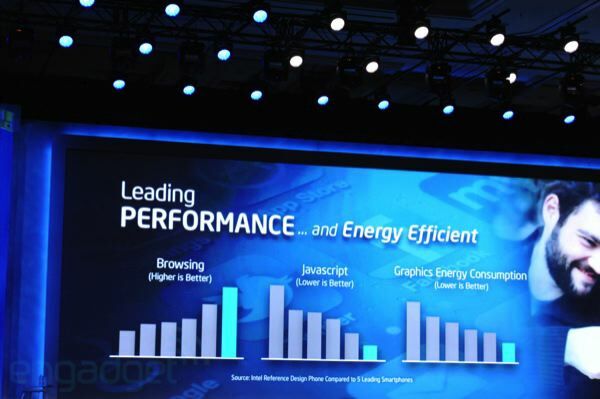 7:58PM Intel reference platform outperforms unnamed competing phones. 7:57PM 10 pics in about a second, impressive! 7:56PM Now there's a person in a black body suit helping them show off burst shooting. 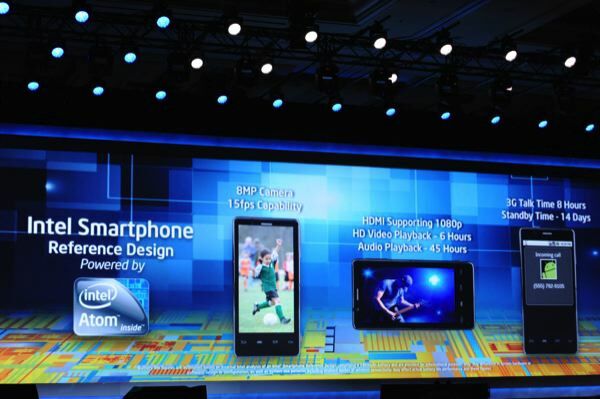 7:56PM Reference design is 8MP, but hardware supports up to 16MP. 7:56PM And it'll play Fruit Ninja too! Sold! 7:55PM And, of course, Angry Birds comes out. 7:55PM Google might have something to say about this since we're talking Gingerbread. 7:55PM "The most performant version of android on the planet" Performant? 7:54PM Timelapse video comparison of battery life of the reference medfield device against some generic looking Android device. 7:53PM The room is decidely less excited about this. 7:52PM Now we're getting a demo of the software features. 7:51PM Oh, and NFC, of course. 7:51PM 6 hours of HD video playback, 45 hours of audio, 8 hours of talk over a 3g network and 14 days on standby. 7:50PM It's running Android on an Atom, with an 8MP camera, 1080p video capture. 7:49PM But the reference design we've already seen is out on stage now. 7:49PM And just like that it's gone. 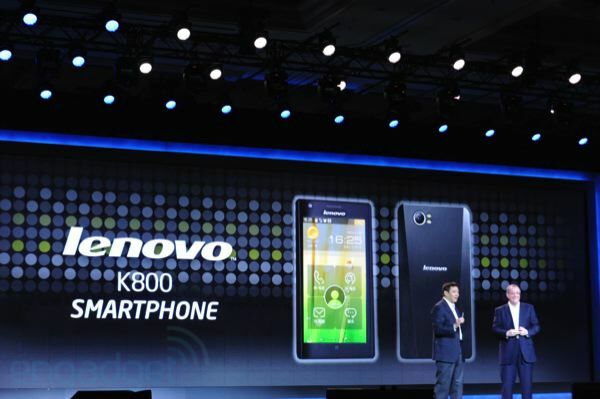 7:48PM Lenovo will have the K800 and a 10-inch Atom-powered tablet at their booth on the show floor. 7:46PM And he's holding it upside down! 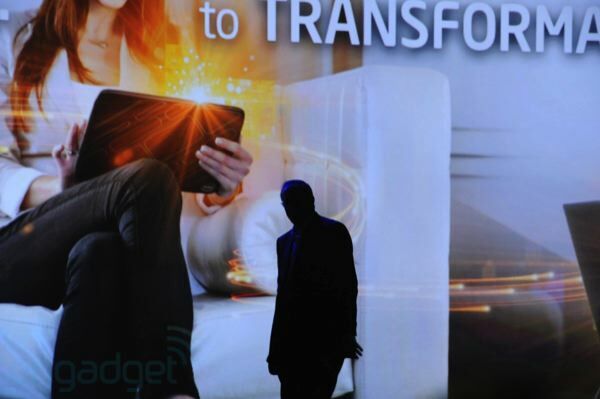 7:45PM The next wave of devices will be connected and powered by the cloud... how that's different than our current crop of high-end smartphones isn't clear. 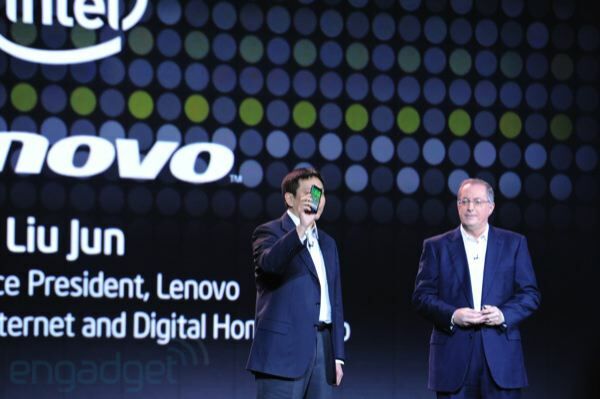 7:44PM Here comes Senior VP at Lenovo Liu Jun to introduce the first Intel-powered smartphone. 7:44PM First market will be China. 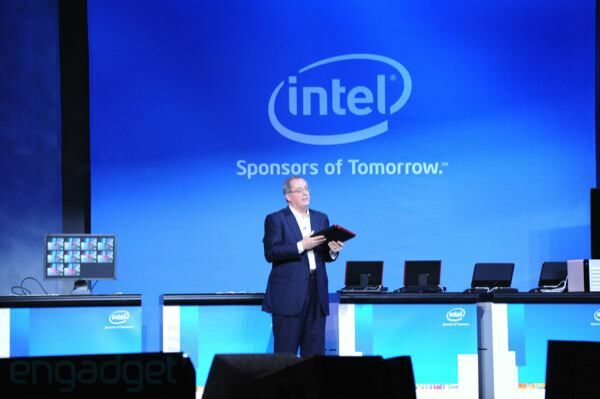 7:44PM The best of Intel's computing is now coming to smartphones. 7:43PM Only 10% of phone activity is actually voice calls. 7:43PM Your smartphone has more computing power than the computers that put a man on the Moon -- an oldie, but goodie. 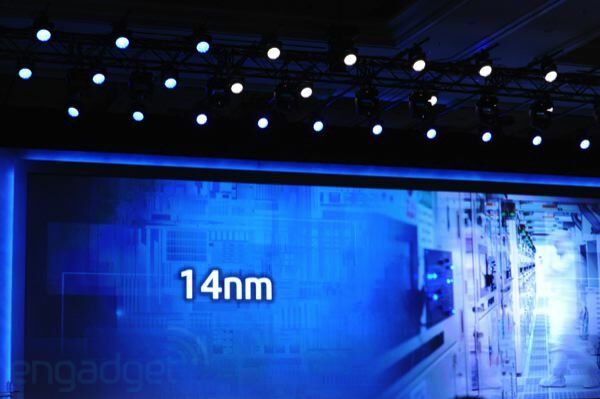 7:41PM There are a billion transistors on modern processor. 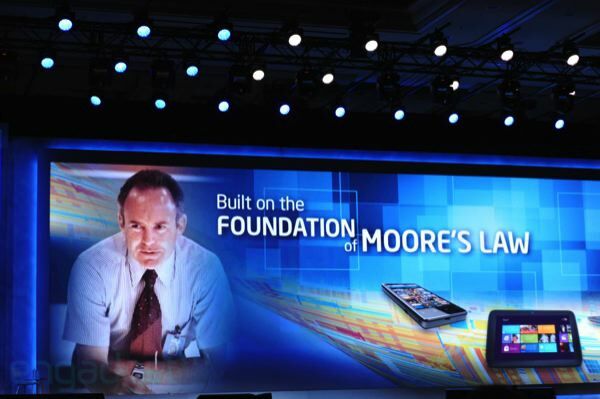 7:40PM Intel still stands by Moore's Law. 7:40PM Talking about seamlessly integrating security to make it easier and safer for users. 7:39PM Engaging, consistent, aware and secure. 7:39PM He believes there are four essential keys to personal computing. 7:38PM Talking about the shift from the "personal computer" to "personal computing." 7:37PM "What we've seen is nothing compared to what's on the horizon." 7:37PM And here comes the man himself -- Paul Otellini. 7:36PM "With intelligence everywhere, there's no limit to what we can do"
7:35PM Wonder what they've got in store for us... could it be Medfield news? 7:34PM Time for a little commercial. 7:32PM "every year the company finds new ways to drive innovation forward"
7:32PM He's talking up Otellini's record as CEO, calling his reign a huge success. 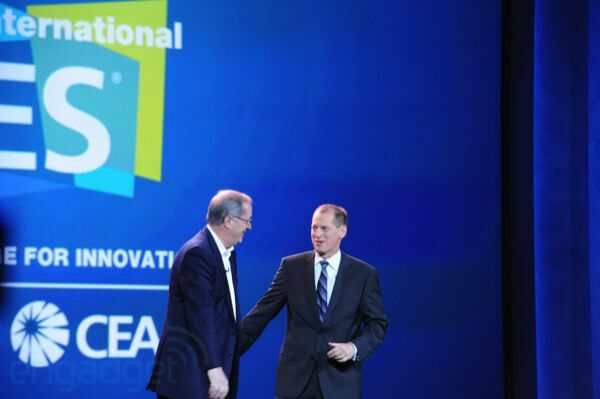 7:31PM And here comes Gary Shapiro to introduce Paul Otellini. 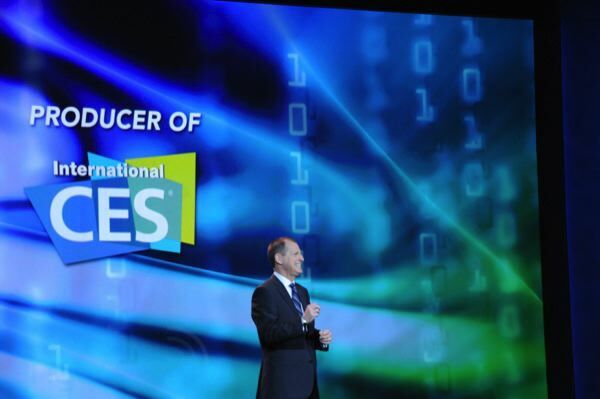 7:29PM Ke$ha the official soundtrack of CES 2012? 7:29PM Lights are down and here we go! 7:28PM Translation: it's about to get real in here. 7:27PM We've been asked to silence our cellphone (fine) and disable our "wireless devices" (not a chance). 7:26PM In the future, if Intel has its way, we'd all listen to nondescript electronic music populated by piano loops. 7:22PM We're less than ten minutes away from the start in theory, but there's still a lot of people filing in and searching for seats. 7:19PM We're in and seated and being treated to some increasingly loud house music. Fingers crossed Paul Otellini comes out spinning glow sticks.